Pittsburgh toilet, squeaky cheese, city chicken, shampoo banana, and Chevy in the Hole are all phrases that are familiar to Midwesterners but sound foreign to anyone living outside the region. 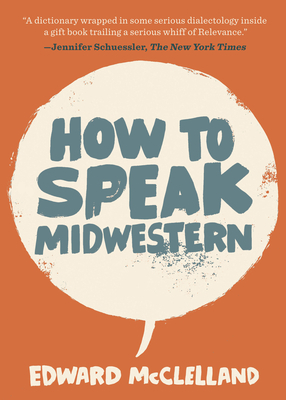 This book explains not only what Midwesterners say but also how and why they say it and covers such topics as: the causes of the Northern cities vowel shift, why the accents in Fargo miss the nasality that’s a hallmark of Minnesota speech, and why Chicagoans talk more like people from Buffalo than their next-door neighbors in Wisconsin. Readers from the Midwest will have a better understanding of why they talk the way they do, and readers who are not from the Midwest will know exactly what to say the next time someone ends a sentence with ”eh?”. Edward McClelland is a journalist. His writing has appeared in publications such as the Columbia Journalism Review, Los Angeles Times, New York Times, and Salon. He is the author of Nothin’ But Blue Skies and Young Mr. Obama. He lives in Chicago.